Thanksgiving arrives in three days, and to the turkey and trimmings we can add four helpings of Detective Montalbano, the worldwide hit series based on the crime novels by Andrea Camilleri and starring Luca Zingaretti as the titular police inspector. Michela Pardo, a rather odd woman, goes to the Vigata police station to report the disappearance of her brother, Angelo. What she and Montalbano discover at Angelo’s home is that he is, in fact, dead. Murdered after what looks to have been some hanky panky. 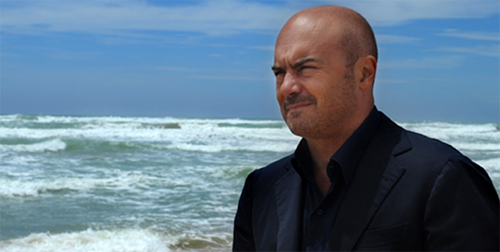 Montalbano wakes to find the carcass of a dead horse on the beach by his house in Marinella. Minutes later, it’s gone. And soon after that, the sultry Rachele Esterman waltzes into his office and reports her thoroughbred horse missing. Stable owner Saverio Lo Duca believes the thefts of both his and Rachele’s race horses were a vendetta, but Montalbano thinks they could be linked to the illegal horse racing run by the Mafia in Vigata. A beautiful young woman is found naked on the beach in Sarsetto, dead from a gunshot to the face. Dr. Pasquano (Marcello Perracchio), the pathologist, gives Montalbano the only clue to her identity: a butterfly tattoo on her shoulder. Montalbano’s investigation leads him to a social services association with church ties, while in other Vigata police matters, the shrewish Ciccina Picarella insists that Montalbano look into the kidnapping of her husband. And on the homefront, Salvo’s relationship with longtime girlfriend, Livia, is on the rocks. The Augellos’ son has gone missing. While searching for him, Montalbano discovers an unauthorized apartment underneath Mimi’s house. But that’s not all he finds. Inside a trunk is the corpse of a murdered 15-year-old girl. As Montalbano investigates the builder, Spitaleri, and the death of one of his workmen at Mimi’s villa, things really heat up when Salvo gets acquainted (ahem) with Adriana, the dead girl’s gorgeous identical twin sister. Enjoy the Montalbano marathon, and Happy Thanksgiving!